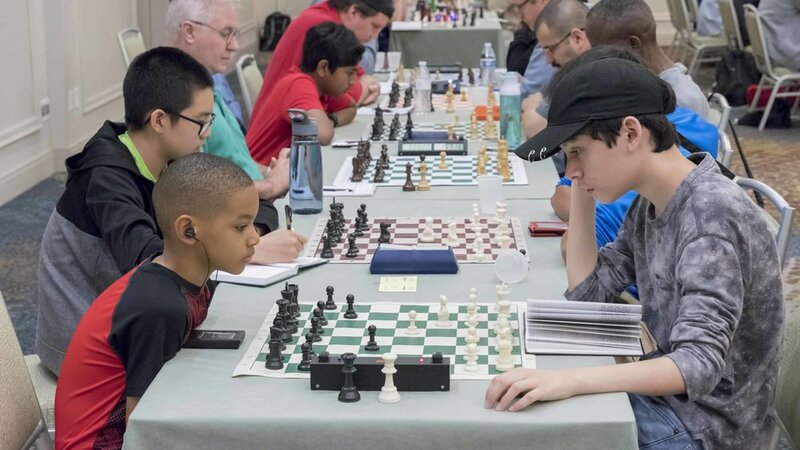 Final round, board 1, IM Rafael Prasca (2433) (L) vs Arnold Banner (1857) (R), CFCC 2018 Sunshine Open & Scholastic held at the Westin Lake Mary. 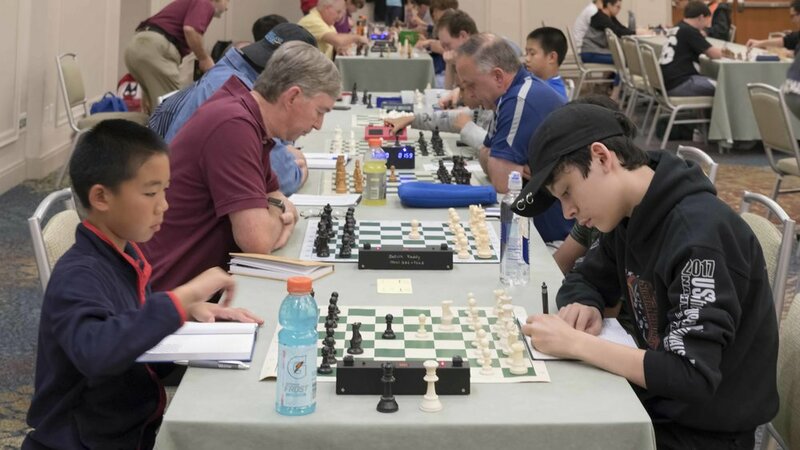 The 2018 Orlando Sunshine Open was held on June 8-10. 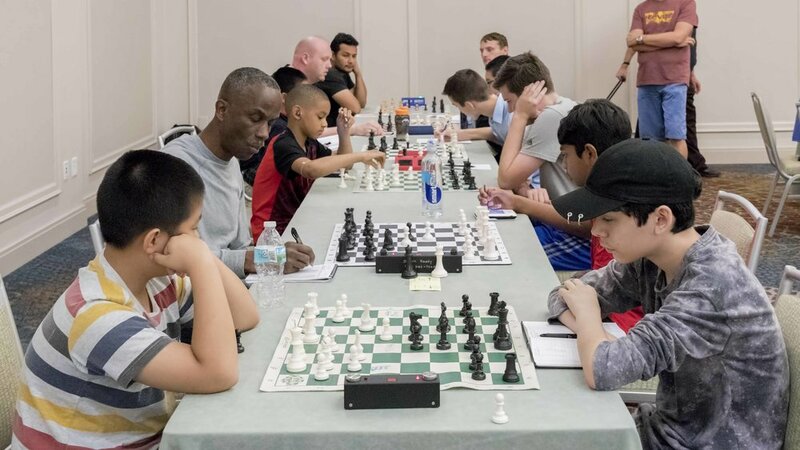 Central Florida Chess Club had long held this annual summer, 3-day event in Southwest Orlando at a hotel on International Drive. This year, however, there was a new location for the event, The Westin Hotel in Lake Mary. Players seemed to really enjoy the newer, more luxurious venue on the east side of town. 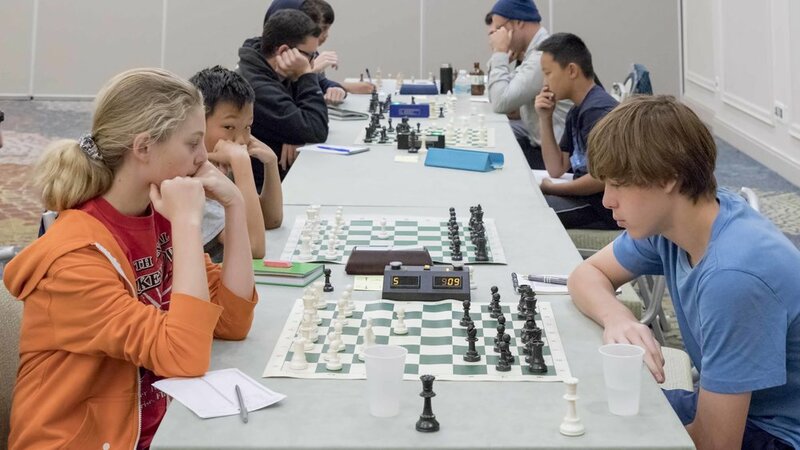 The tournament was initially slated to have 4 sections, but on Friday night there were only a pair of experts playing in the top, “premier” section, Theo Slade (2127) and Evan Stewart (2004). Evan won the game after an exchange sacrifice which led to a brilliant kingside attack. After only 3 more players registered for the premier section on Saturday morning, the premier and U2000 sections were merged before Saturday’s first round. As a result, a wealth of prizes were offered to players in the new Premier/U2000 section. Among the last to register on Saturday morning were IM Rafael Prasca (2443) and FM Corey Acor (2378) who both had their sights set on the $700 first prize in a field with no other masters. All three sections were very competitive. Not a single player in the entire tournament finished with a perfect score. Heading into round four on Sunday morning, only 3 players in the top section managed to score 3 points. Rafael, Corey and John Givler (1961). Givler lost on board 2 to Arnold Banner (1857) who played a strong game with the black pieces and now had 3.5 points going into the final round. Meanwhile Corey played as white against Rafael on board 1, in what was the de facto first place game between the two strongest players in the tournament. The two players had no interest in taking a quick draw and rather sought to battle for all the marbles. The dynamic game went to a deep endgame where it was legitimately drawn. This meant Corey, Rafael and Arnold were the only 3 undefeated players in the top section with 3.5points. In the final game Rafael and Corey would take care of business. Corey defeated Theo Slade. Arnold Banner put up a good fight against Rafael for a while on board one, but as the game transitioned to into the endgame it became clear Rafael had obtained a winning position. Congratulations to IM Rafael Prasca and FM Corey Acor who shared first place honors with 4.5 points and went home with $595.00 each. John Givler had an impressive showing with 4 points and clear 3rd place earning him $490. Ryan Hamley (1993), Arnold Banner, Connor Eickelman (1764) and Christopher Fashek (1614) each received $297.50 for best U2000 prize with 3.5 poins each. Coren Meeks (1764), Leon Cheng (1726) and Carlos Rivas (1721) won $70 each for the U1800 prize. 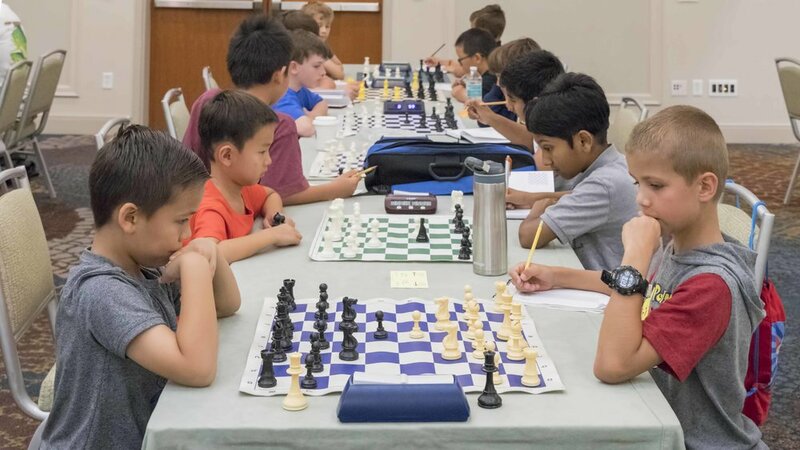 The Scholastic/U1200 section also ended with a tie for first place. 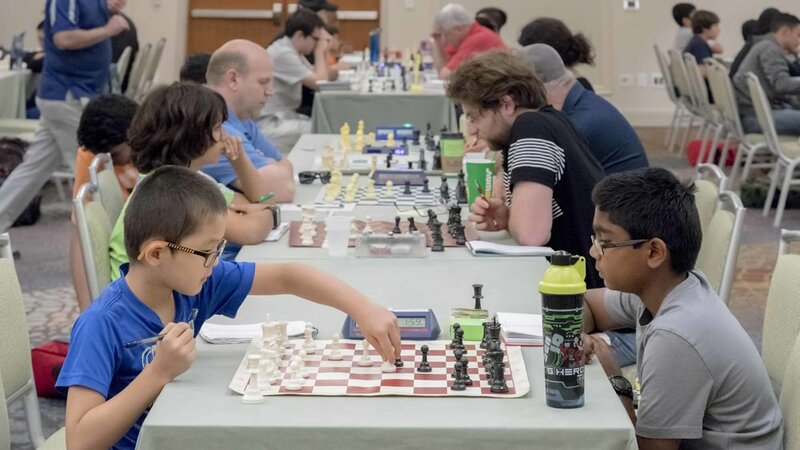 Eight year old Jolie Huang (1106) and eleven year old Matteo Labrecque (1062) drew the final game to finish with 4.5 points and $245 each. Luke Wu (1173), Akshat Suresh (1143) and Sam Matini (1131) all walked away with 4 points and $35 each in tie for 3rd place. After losing his first round Andersen Liao (686) would go undefeated with 3 wins and a draw to win the $70 U1000 prize. Congratulations also to the top players in each age group who won trophies! 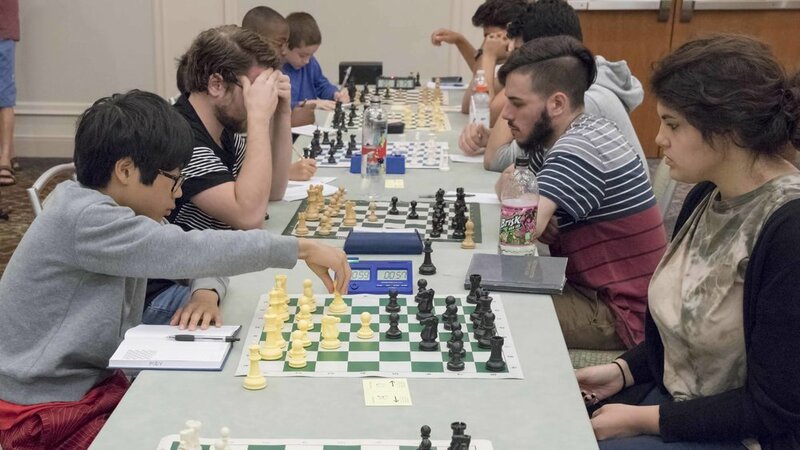 The tournament was organized by the Central Florida Chess Club who held their meeting on Saturday morning and announced that they will be awarding two chess scholarships later this year. The tournament directors for the event were Steven Vigil and Harvey Lerman, who was presented with an honorary CFCC life membership for his decades of service and dedication to the club. Alex Zelner of OCG provided the chess store which featured great books and chess merchandise. Going into the Sunshine Open, only Satvik Reddy (1860), Evan Stewart (2004), and I (2127) had entered the Premier section. Evan and I were in the three-day schedule whilst Satvik was in the two-day schedule which meant that on Friday night I played Evan. The top two sections could not really be merged at this point given that many players could have entered the Premier section two-day schedule on Saturday. Evan was White, and we played the Anti-Berlin. Both sides committed a couple of mistakes before he made a strong exchange sacrifice. However, I missed my chance to return the extra material and reach an equal position, instead allowing a devastating Kingside attack. Evan made no mistake, and after forty-five moves I resigned. However, immediately after this game, Harvey Lerman asked me if I would like to re-enter. Where I am from, in England, there is no option to re-enter; we only have one schedule! And I had never re-entered before in America as you have to pay another entry fee, you have to fit another game into an already tiring schedule, and adjust to playing a shorter time control in the first round of the two-day schedule, only to have to adjust back to playing with the time control you played with on Friday night. All of this sounds like a lot of inconveniences, especially when you consider that after all of that, you still may lose on Saturday morning! Then it would all be for nothing! Despite all of this, I nevertheless decided to re-enter anyway, although ultimately it did not turn out very well . 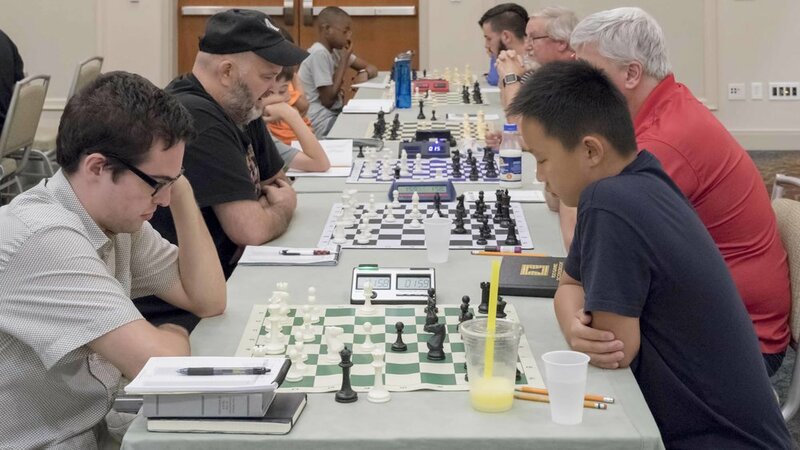 . .
Perhaps Paul Leggett (1832) has got it all figured out: he lost on Friday night, re-entered, and then took a bye on Saturday morning. This way, he is guaranteed at least half a point out of his first round even if he loses, and he does not have to adjust to a new time control twice or play an extra game. One final quirk of all this is that for the rest of the tournament, I cannot play Evan anymore because he played me in the first round! When we played each other, we were the top two seeds in the entire tournament, including all sections! If we had have known then that the sections were going to be merged on Saturday, we could have merged the sections on Friday and we would have both played lower rated opponents. It would have been disappointing from a competitive standpoint if both of us had tied for first on 5/5 without the chance to play each other again since I re-entered . . .
On Saturday morning I was paired Black against William Xu (1720) on board two, with IM Rafael Prasca (2433) on board one. 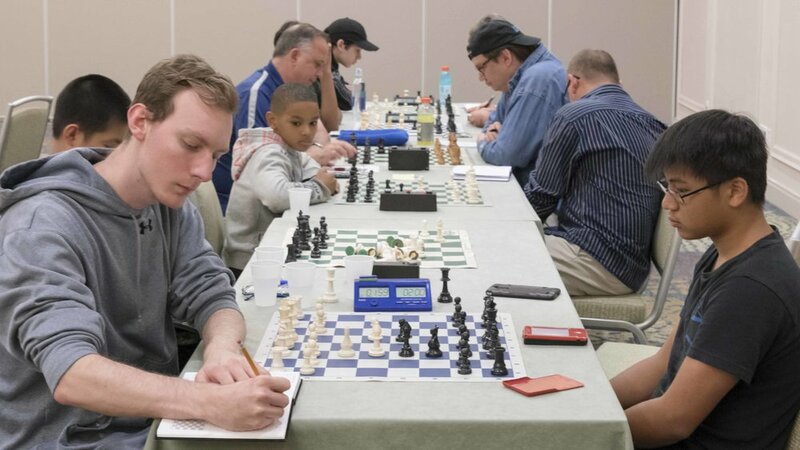 However, at the last minute, Corey Acor (2378) entered, which meant that my pairing was the same, but instead on board three as White against the same opponent . . . Or was it? Actually, I was not playing against William Xu, but William Wu (1668)! No wonder my Dad misread the pairings; the names were so similar! Anyway, William Wu resigned after fifty moves. In the meantime, Rafael beat Nicholas Weisberger (1724) as White and Corey dispatched William Xu as Black. On Saturday afternoon the two schedules merged, and Paul beat Wyndell East (1644) as Black. I played the Nimzo-Indian Defense against Leon Cheng (1708) and he resigned after thirty-one moves. This meant that I was on 2/2, maximum points, despite losing my first game! Meanwhile, Rafael won again, this time as Black against Zoe Zelner (1837) in the French Defense. Corey defeated Connor Eickelman (1772) as White in a Rook endgame. On Saturday evening, I lost to John Givler (1942) in the Modern Benoni in a four-hour game. In my opinion, he played a brilliant sacrificial game, regardless of what the engine says and deserved to win. In the meantime, Paul won again as White against Sivaji Hariharan (1913). This meant that Paul was on 2.5/3 but obviously if there was only one schedule the maximum score for him would have been 2/3, so both Paul and I benefitted from the option to re-enter. Rafael extended his win streak in the antepenultimate round on the top board, defeating Ryan Hamley (1993) with the White pieces. Corey followed suit, beating Evan as Black. Going into Sunday morning the top two seeds, who were both on maximum points, faced each other on board one. Corey was White, and at one point offered a draw, which was declined by Rafael. However, eventually, the point was indeed split. Credit to both players for playing a true fighting game of chess rather than agreeing on a quick draw. In the last round, Rafael had Black again, facing Arnold Banner (1888) on the top board. Despite the enormous rating disparity, it was a very long, exciting game with a lot of spectators watching at various points. At one point, I counted as many as eleven people watching at once! However, in the end, Rafael prevailed, meaning that he finished on 4.5/5. On the second board, I was White against Corey and I played the Queen’s pawn opening. However, Corey played very well to checkmate me by underpromoting on the sixty-first move. That meant that Corey and Rafael tied for first, with John finishing third outright. Special mention should also go to Christopher Fashek (1614), who gained a whopping 107 rating points! Congratulations to the two highest rated players, Rafael and Corey, who shared first!